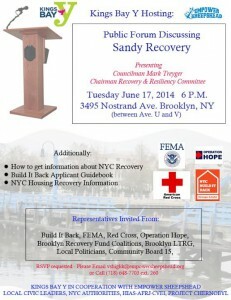 Hear the latest in NYC Sandy Recovery featuring Council Member Mark Treyger, Chairperson – Committee on Recovery and Resiliency. Members from the Brooklyn Recovery Fund Coalitions, Brooklyn LTRG, NYC Build It Back, FEMA, American Red Cross, Operation Hope, local politicians and Community Board 15 have also been invited. Please RSVP, vshiglik@empowersheepshead.org.